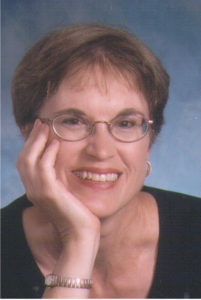 Share Your Story…Submitted by Arlene S.
After first being church’s rep, I served on Women’s Service Board for 20 years. During this time, besides visiting patients, for 15 years I made hundreds of toys for the Plain and Fancy sale. My husband spent his last day before his death, and for years we both were (are) on inactive list for admission. At 93 I still have pleasant memories of Al Foster and especially of Garth Brokaw, who also had been an interim pastor of our church. It was an exciting time to witness the change of facilities when the pods were introduced. “The spiritual and physical care my mom received from the staff was a blessing to her and to me.” When mom moved to Fairport Baptist Homes, I promised her that I would attend chapel services with her every Sunday. As she became increasingly frail, her faith and her family became mom’s world. We skyped weekly (mom called it spiking) with my brother and sister who live in Maine and Georgia respectively, and my daughter in Chicago, using the computer provided by Fairport Baptist Homes. Every time I visited, we prayed in the chapel for her family members using the prayer rocks. A few months before her death in late June, 2016, I was discussing with the chaplain, Jenny, the fact that we had placed mom in hospice, and that even though her abilities were slipping away, she could still remember the words to hymns and the Lord’s Prayer and that she was not afraid of dying. Fairport Baptist Homes provided my mother every opportunity to experience her faith during the last three years of her life. The spiritual and physical care my mom received from the staff was a blessing to her and to me. 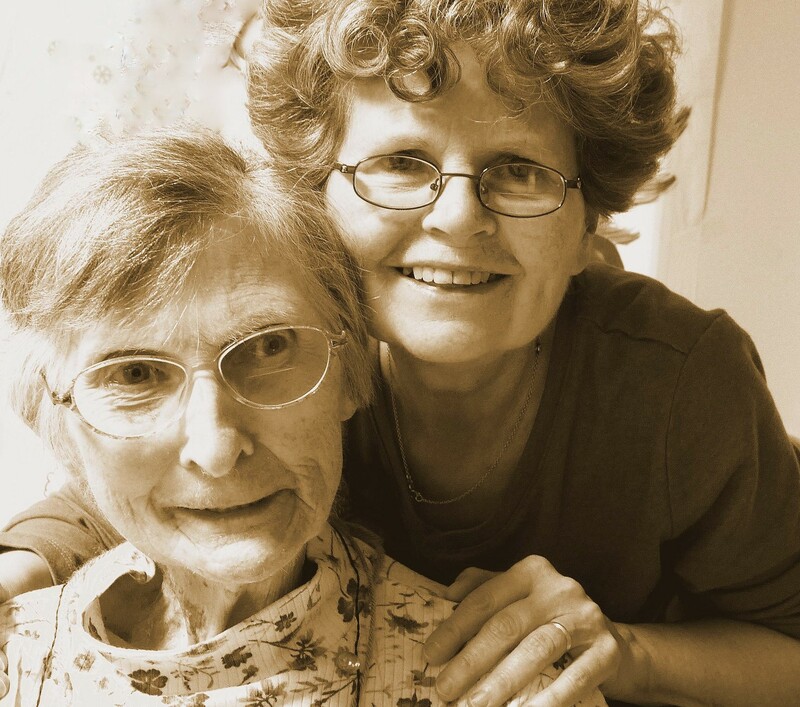 As one year draws to a close, and another begins, I hope you’ll join me in making a gift to Fairport Baptist Homes, so other residents can enjoy the kind of high-quality care my mom did. Thanks for your past support—we hope we can count on you again!—Valerie And best wishes for a Happy, Healthy New Year! The Dotterer’s Story; At FBH There is A Difference. Neal Dotterer’s family had struggled to maintain his mother Sally’s independence. 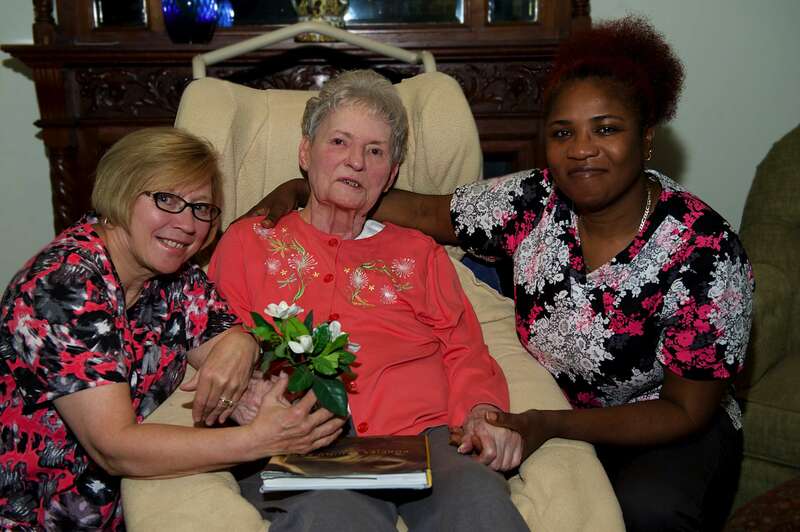 When her health needs eventually required the 24 hour care a nursing home could provide; his family made the decision to choose a home near his sisters in Syracuse, NY. Neal, who lives here and owns the UPS store in Fairport Village Landing, visited his mom there until his sisters moved from the Syracuse area. At that time, Neal says he “absolutely” knew that he would move his mom to Fairport Baptist Homes. “There was no question, no hesitation; I knew she had to come here.” Since arriving, Neal says he is forever grateful and has noticed a positive change in his mom. Although she has cognitive problems and it’s hard for her to communicate, Neal says the staff “on 2F, especially Jane and Vaughnette are awesome and amaz­ing” with his mom. “She has an ease now about her, I see a difference in how she reacts to people” and he knows the household environment and nursing staff are key to those changes. He explains the difference at FBH; “In the other place… it was residents lined up along the long hallways. That was it. Here… it’s out- going and friendly and people are smiling. People seem to do things on their own time more. Jane is wonderful with my mom. I always heard good things about FBH and have been long involved- but I still didn’t realize how personal it would become for me. I can relax now, without worrying, that means everything to me. The setting is so much better, the atmosphere is relaxing. I know it’s not an easy job the nurses have—but I can tell the staff here must be working here because they love what they do; and it’s not like that everywhere. There appears to be more one- on- one, they seem to have more time to just ‘care’. The small number of people in the pods– the households, it feels like home, like family. It makes such a big difference to her…and me”. There are no typical days at the Tool Thrift Shop in Fairport Village. You never know what donated inventory will enter the door or which volunteers will appear to help clean and price it. About the only things you can count on are great bargains, a friendly atmosphere, and that area seniors will reap the benefits of all the shop’s proceeds–$250,000 over the first five years! All proceeds benefit Senior Options for Independence; a partnership with Fairport/Perinton Senior Living Council and Fairport Baptist Homes. During its first four years, the shop was unique in fundraising and the only one of its kind in existence. This year, however, the leadership team mentored the startup of a similar operation in Albany. Visitors find not only a sometimes-offbeat collection of tools and hardware-recent items include a jeweler’s anvil and a hook for animal carcasses-but also friendly suggestions on how to do their latest project from the staff. The all-volunteer staff of the shop has decades of experience in everything from photography and electronics to antique cars and fine woodworking. The friendly families of workers are rarely in a hurry and know their customers, so if a shopper needs a referral or advice, the Tool Shop is the place to get it. A few figures: The shop is open three days a week, and an average sale is only $9. Hardware sales constitute approximately 1/4 of those sales at an average of 50 cents per bag. During just three days of retail time, sales are strong and steady. Staff works behind the scenes almost seven days a week, providing eight hours of labor for every hour that the shop is open. These quick facts only begin to tell the story, which also includes donors who are downsizing or packing away utensils that their now-departed loved ones handled and cherished. Rather than go into landfills, those tools find a new home and carry on the imprint of their original owners. For more information about the Fairport Thrift Tool Shop visit our website at www.toolthriftshop.org. To donate items to the shop please call us at 585.223.0484 or stop in during hours of operation: Tuesdays 4-8pm, Fridays 11-6pm, and Saturdays 9-4pm. Technology has changed us all. It can connect families across a few miles, across an ocean or those separated because of one person’s care. Dianne Andrus was busy working as a nurse practioner when her mother came to FBH. Dianne was her mom’s primary caregiver and her sisters (also trained nurses) lived states apart. 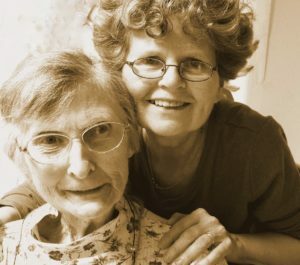 Diane used Facetime to connect her mom to her sisters and also so they could discuss her mom’s care needs. “Surprisingly for nurses”, she laughs “we agreed on her care” but Dianne says the time spent connecting with Facetime is what really kept the family close. When Dianne’s mom passed away, she requested any donations made in her mom’s memory be used toward purchasing a laptop and iPad for FBH families to use. After they were purchased, Dianne worried about out of town families whose loved ones were unable to use the technology independently. 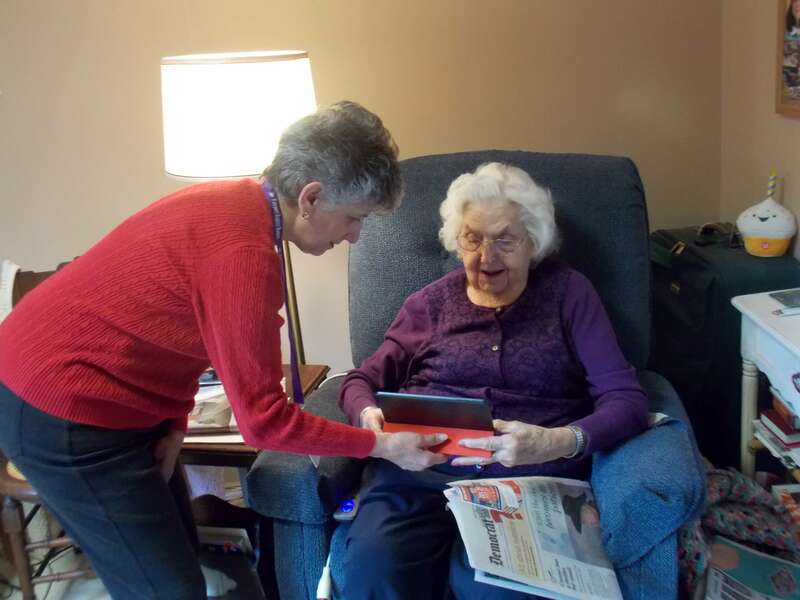 She thought it would help if someone on site could be available to help connect them, so she decided to volunteer herself and personally contacted all our out of town families to offer to help them stay in touch. Since starting the program, many families video chat regularly, some while they are away for the winter, other families call Dianne spontaneously to set up a chat. Families have used her help to connect as far away as Australia. Dianne recalls a gentleman on hospice whose daughter was able to see him by using Facetime and although he had incredible health challenges, he overcame them to kiss the screen.